Michał Sędziwój (Michael Sendivogius). Skorsko or Łukawica Poland 1566-Cravar, Silesia 1636. A New Light of Alchymie. London: Printed by Richard Cotes, for Thomas Williams, 1650. 18.5 x 14.5 cm. Bound in full brown sheepskin. Bookplates: Boston Athenæum. Inscribed on title-page: “Sam’l Danforth." Gift of Thomas Danforth, 1812. The medieval protoscientific practice of alchemy is broadly defined as a chemical philosophy whose chief aims were the transmutation of base metals into gold, the discoveries of a universal cure for disease (the panacea), and the discovery of a means to prolong life indefinitely (the elixir). The highest aspiration for alchemy’s practitioners was the discovery of the philosopher’s stone, a mythical substance or chemical preparation believed to have the power of transmutation. By the eighteenth century, alchemical research waned in Europe, but it seems to have been pursued longer in New England, possibly because New England colleges introduced modern chemical instruction later than European institutions. The Boston Athenæum’s records from early 1812 register the gift of more than two dozen publications on alchemical topics, most of which are comprised in what is known as the Danforth Collection. The collection was built not by its principal donors, the brothers Dr. Samuel Danforth (1740-1827) and Thomas Danforth (1742-1825), but by their father, the Hon. Samuel Danforth (1696-1777). The elder Danforth was a Massachusetts judge and “an earnest seeker of the philosopher’s stone.” He was widely enough known for his alchemical pursuits to be ridiculed for it by skeptical political foes in a 1754 pamphlet that referred to him as “Madam CHEMIA.” In spite of his critics, Danforth apparently persevered in his experiments, writing of his discovery of the stone to Benjamin Franklin years later. Danforth is believed to have begun building his alchemical library as early as 1721. Twentieth-century scholarship asserts that, although Danforth’s is not the most significant collection of its sort, he “could hardly have selected a more representative collection of writers for his study of alchemy.” The collection today contains twenty titles, most of which date from the seventeenth century. Many of the books are compilations of tracts and treatises by more than one author, such as the two-volume Bibliotheca chemica curiosa (Geneva, 1702), the six-volume Theatrum chemicum(Strasbourg, 1613-1661), and Artis avriferae (Basel, 1610), “one of the chief collections of standard alchemical authors.” Many also contain symbolic illustrations and instructive foldout tables, including The Last Will and Testament of Basil Valentine (London, 1670), with several woodcuts, and the Theatrum chemicum britannicum (London, 1672), edited by Elias Ashmole (1617-1692), founder of Oxford’s Ashmolean Museum, with engravings by Robert Vaughan. Some volumes contain chemical recipes that seem fantastical to the modern reader, musings on religion and science, and even addresses to non-believers. 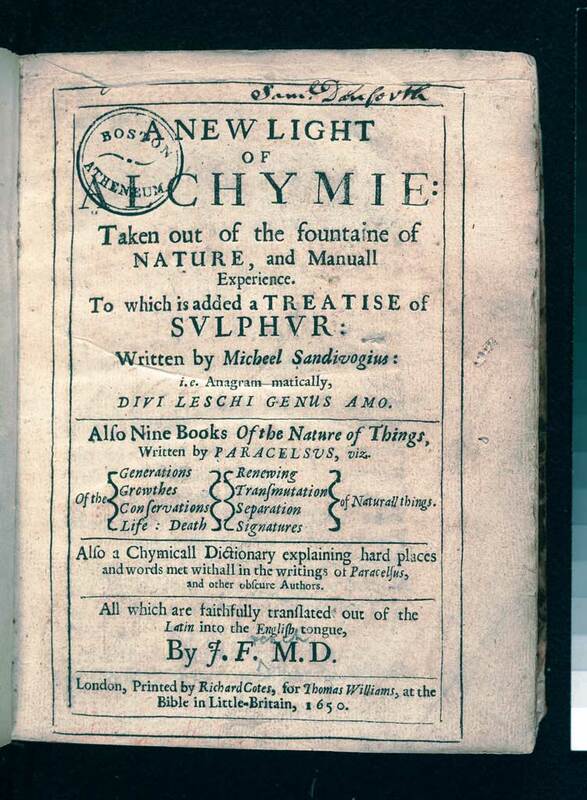 A New Light of Alchymie (London, 1650) is an English translation of works by the Polish alchemist Michael Sendivogius. It includes writings by Paracelsus (1493 or 1494-1541), the influential Swiss doctor and chemist Theophrastus Phillippus Aureolus Bombastus Von Hohenheim. The translator, “J. F.,” is believed to be John French (1616-1657), an English army surgeon, author, and editor of several alchemical works. (“French” has been lightly penciled in beside the initial “F” on the title-page.) The primary author, Sendivogius, greatly admired by his contemporaries and by future alchemists, made his mark on modern science with his treatise De lapide philosophorum, which contains what is considered to be the first idea of the existence of oxygen. As is the case with numerous volumes in the Danforth collection, A New Light of Alchymie contains many underlined passages and detailed marginal notes that seem to track the results of experiments, indicating that it was frequently consulted by its previous owners. Judge Danforth died in 1777 and his alchemical library is believed to have been inherited by his eldest son Samuel, a prominent Boston doctor who was known to share his father’s love for chemistry. In his essay “New England’s Last Alchemists,” Wilkinson suggests that the demands of his busy medical practice forced Dr. Danforth to suspend his alchemical experiments and donate his collection to the Athenæum. The Library’s records and Josiah Quincy in his Athenæum Centenary, however, list Dr. Danforth’s brother, Thomas, as the donor. Many of the books contain plates naming Thomas as the donor but also contain inscriptions naming Samuel as donor. (To further cloud the matter, in 1776 Thomas left Boston for London, where he apparently remained until he died in 1820.) Dr. Danforth, who one biographer concluded was “probably New England’s last alchemist,” contributed one additional work to the collection before his death in Boston in 1827. Kara Stepanian, from, Stanley Ellis Cushing and David B. Dearinger, eds., Acquired Tastes: 200 Years of Collecting for the Boston Athenæum (2006): 66. Copyright © The Boston Athenæum. Ronald Sterne Wilkinson, “New England’s Last Alchemists,” Ambix 10 (October 1962): 128. Clifford K. Shipton, Sibley’s Harvard’s Graduates (Boston: Massachusetts Historical Society, 1942), 6:81-83. Albert H. Smyth, ed., The Writings of Benjamin Franklin (New York: Macmillan, 1907), 6: 105-106. John Ferguson, Bibliotheca chemica (Glasgow: James Maclehose and Sons, 1906), 1:52. Charles Coulston Gillespie, ed. Dictionary of Scientific Biography (New York: Charles Scribner’s Sons, 1975), 10: 304, 311.